Another person put down everything I was feeling. I believe it was a family member since it was posted under her account. For more information, please visit our Grief Group For GP Warriors. "My good friend Kerri Laman passed away day before yesterday. She was only 40 years old. She used study Human Development and Family Studies at Colorado State University, with degrees for the Deaf and Blind to help them. I feel like I've lost too many friends over the year. "She didn't have to die yet, the state of medical care in this country killed her. Kerri and I originally met on a service dog forum many years ago. She was an amazingly talented person as well as selfless and with a childlike innocence and sincerity. She trained her own seeing eye dog! Those in the SD community understand how difficult and special that is. When she needed more mobility assistance she was unable to get another guide from an organization. Kerri's medical care was complex due to the multiple disorders she had and especially by her blindness. She was dependent upon a form of IV nutrition called tpn to live and many IV medications. Being blind obviously complicated this and she relied on a home health nurse to come daily and set things up for her to be able to use safely and continue to live independently. She struggled with frequent hospitalizations due to life threatening infections. At her last one it was determined she was no longer able to live at home alone. She would need to find a skilled nursing home to be discharged from the hospital. That discharge never happened, after being turned away from 51 different skilled nursing homes. They refused to take her in due to her tpn requirements. Insurance didn't allow for any further assistance in her home than she was already receiving. Kerri had many friends both online and in her assisted living apartment complex. She continued to work from home for jamberry until not too long ago. In her younger years she was a competitive ice skater despite the blindness. Had also recently been correctly dx with conditions that explained symptoms and complications she'd experienced for MANY years and started treatment. (it takes way too long to receive correct dx). Now we will never know how much function she could have gained back. Especially improvement of the immune system to prevent the frequent life threatening infections. Due to the inability to find medical care in the form of a safe place to live, she made the only choice she had which was to die. It didn't have to be this way. She decided upon the next infection she would not treat it. That was taking too long, and she began to discontinue treatments that sustain life such as the tpn and iv hydration (she was completely unable to use her gastrointestinal tract.) She has now passed on. We need to improve the medical options available for complex patients. We need to improve insurance so people can receive the care they need. We need to stop the incentives for Dr's to refuse care (for fear of litigation and punishment from the government. Today in medicine it's safer for Dr's to walk away from complex patients than open themselves up to the risk, something I've experienced myself as well.) We need to incentivise medical professionals to provide the best treatment they're able. We need to improve. We need to change. We need to save the Kerri's of the world, allow them to live as long as possible to contribute to the world. No one should die simply because people weren't willing to TRY. She didn't die because her condition got worse. Not because there were no treatments available. She didn't die waiting for a medical breakthrough. (though one that could have cured some of her conditions instead of maintaining them is a future goal!) She died simply because no one was willing to provide what she needed and was available. She had so much more to give the world. She is survived by family- including her amazing Labrador guide and mobility assistance service dog Sophie as well as her daschund Mandy." This was a needless death. It makes me angry I lost one of my good friends because she kept getting refused medical care. This has happened so often enough that the Emergency Room (ER) doctors do not take me seriously but, in my experiences, the nurses are by far the worst! I went in a few years back and I was in incredible pain. My body was just not working well and I looked like I was 10 months pregnant. I hadn’t pooped in two weeks either and I was throwing up bile. My doctor sent the Emergency Room a message that I was coming in at his request and that he wanted a contrast Cat Scan done immediately. Well, that didn’t happen. I told them my conditions and expressed that the Gastroparesis and the IBS-C together were really hurting me to the point where I couldn’t even walk. The doctor did an x-ray, told me I was constipated, and that he was sending me home. I put my foot down and said, "NO! Do what my doctor asked you guys to do." He replied that he didn’t have to follow the doctor's recommendation and that he was discharging me. The Emergency Room did no blood work, no IV fluids, and told me to go buy Miralax and take it once a day. I was shocked! I was already on it and taking it 3 times a day at my specialists orders. The ER doctor also told me to stop eating so much and I wouldn’t get bloated. The doctor walked out and the male nurse walked back in, pushed my stomach with his fist, moved it around, and then walked out. He proceeded to sit down at the nurses station and they started to gossip about me and that I just wanted "pain killers' and a "quick fix." He also spoke quite loudly that he wasn’t going to be the one to give me an enema. Well, no one did. It was my stomach that I needed help with, not my bowels. I was already getting a prescription for that from my doctor that evening. It hurt so badly when he pressed on my stomach like that. I asked for the doctor to come back in and the nurse told me that he had real patients to see and wouldn’t be coming back in. They told me to get dressed and he had my discharge papers ready. My husband took me home and I laid there and cried. While the medicine that I got for my IBS-C worked great…It didn’t help my stomach as it's not the same issue. I have never gone to the ER again after that. I have literally just laid there and felt like I was dying and cried my eyes out while my husband looked on and couldn’t do anything to help me except keep my hydrated. My GI doctor won’t put me on any prescriptions for my Gastroparesis right now because I have irregular EKG’s and that puts me at risk. I was on a medication before, a liquid and it was my life saver, so of course, the FDA pulled it off the market years ago. So now, I’m stuck. I am opposite of most Gastroparesis patients because I gain weight easily because most of the time my body thinks it's starving. * As I type this, I can feel my stomach growing and becoming distressed and there is nothing I can do. I have cut out so much foods that antagonize it to no avail. I tell the doctors where I’m living at now that I have Gastroparesis and some of them had to look it up online. REALLY?!? We need more awareness. I tell everyone about it and my little sister might have it. She’s getting tested soon. *Note: With Gastroparesis, there are "gainers" and there are people who lose so much weight that they can get down to 90 pounds. This does not mean that a gainer's Gastroparesis is not as important as someone who loses weight constantly - we ALL have Gastroparesis. Your Gastroparesis is no less/no more than mine, and my Gastroparesis is no less/no more than yours. In 2012, I was diagnosed with a GIST (gastrointestinal stromatolites tumor/sarcoma cancer). The surgeon cut my vagus nerve while removing the cancer and part of my stomach. After surgery I couldn’t eat, everything made me vomit. When I questioned the surgeon, if anything happened during surgery that is making me unable to eat without vomiting (Dr. Kassenbrock out of Phoenix, AZ), advised that I shouldn’t worry about it cause I could stand to lose a hundred pounds. Later, I had a stomach emptying test which found that I have over 90% of my food left at the four hour mark and they classified that as severe Gastroparesis. On two separate occasions during a really bad flare of GP, I was trying to get the nausea/vomiting under control with Phenergan. Each time I took it, I would vomit it back up 15-20 minutes later. After several times of this, I became concerned that I didn’t know exactly how much of this drug was actually staying in my system and how much was coming backup. So, I was afraid to take anymore for fear of possibly overdosing myself. So on the advice of my husband, we went to the Emergency Room (ER). They treated me horrible, when shaking all over from pain, stress, nausea, possible shock. Additionally, one nurse actually told me I needed to calm down, quit shaking, and being a drama queen. The doctor just rolled his eyes when I tried to explain to him what was going on, but really it was obvious to us that they just didn’t care. 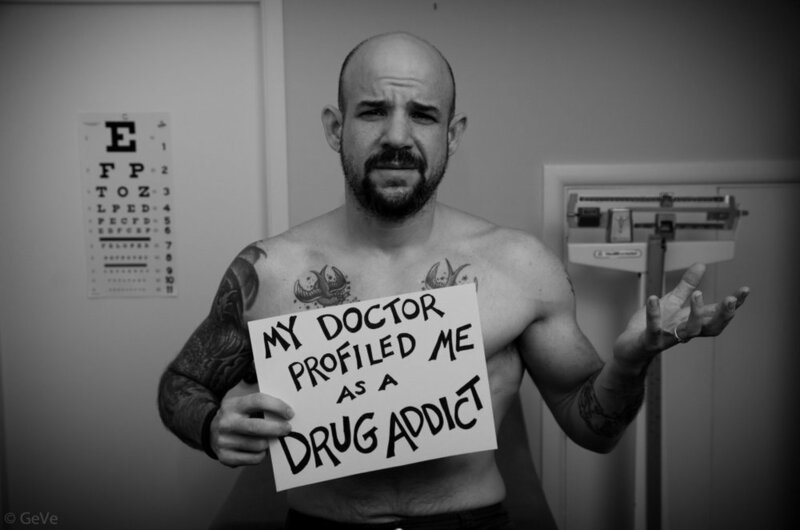 Finally, the doctor said, let’s get to the bottom line, what is it you really want, what drug do you think you need? I answered that I thought I needed phenergan by IV instead of pills, because I keep vomiting up the phenergan pills and was concerned about absorbing too much or too little (they had seen me vomit 5 times since arriving). He again rolled his eyes, whispered to the nurse and then ordered me IV Phenergan. When the IV was completed, the nausea subsided and I was released. Obviously they believed that I was drug seeking, and in a sense I guess I was, but the drug I wanted was Phenergan in a form my body could tolerate to get the vomiting under control. I didn’t ask for any prescriptions or anything else, nor did I want anything else. My husband and I were appalled at this treatment. After I left the ER I finally put it together that they thought I was drug seeking. My second visit to the ER was the same situation about a year later at a different hospital. Now I don’t go to the ER during a flare no matter how bad it is. I finally have managed at this point to control my Gastroparesis (GP) through diet. I do have Gastroparesis flares, but that they are much more infrequent.